Review date: 16 July 2003. It's easy to keep your PC's CPU cool if you don't mind a lot of noise. Copper heat sink, screaming fan; hey presto, cool CPU. Quiet CPU coolers with adequate performance for high-end processors (or highly overclocked lower-end processors...) are harder to find. Look, I had to use that subhead, all right? This thing's called a "Kamakaze". And yes, it's made in Japan. The name is not as tasteless as it sounds. The term "kamakaze" (usually spelled "kamikaze"; they're somewhat interchangeable terms, but Scythe may be doing a bit of Japanese punning here, since "Kama" means "sickle", or "scythe"...) was born in the 13th century, when not one but two Mongol-led invasions of Japan, the only times anyone attempted to invade the Japanese mainland before 1945, were stopped dead by severe storms. The first storm beat the heck out of a big landing force pretty much right there on the beach; the second one ripped apart an even bigger army before their ships even made it to Japan. Contemporary observers had a difficult time believing that this was just coincidence. It strengthened their belief that Someone Up There Liked Japan. That Someone would clearly call down a "divine wind", a "kamikaze", upon anybody who tried invading. So "kamikaze" doesn't just mean "suicide pilot", OK? History lesson concludes. CPU cooler review resumes. Scythe's Kamakaze is not a revolutionary CPU cooler, but it's got a lot of evolution behind it. Hefty copper-bottomed thin-fin heat sink? Check. 80mm fan sitting on a reducer funnel, to give respectable airflow without a ton of noise? Check. Speed control dial for the fan, so you can choose the cooling-versus-noise compromise that's right for you? Check. Neat-o screw-down clip, which you can attach when it's loose and floppy and then tighten up very, very firmly, if you dare? Check. 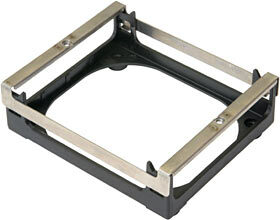 The Kamakaze also comes with this mounting frame to allow it to be used on Pentium 4s; the frame replaces the standard P4 cooler retainer (it's only slightly different, but the Kamakaze still won't fit a stock frame), so you can't attach it to a motherboard that's installed in a case already. There were no fasteners for the frame included with the Kamakaze I got for review, but Scythe tell me they've now noted that you can't always re-use the fasteners that held your factory installed frame in place, so they're now bundling a bag of fasteners (and some heat sink grease) with all Kamakazes. Today's high end P4s are quite serious heat-pumpers, but their stock coolers have kept pace and provide more than adequate performance for all but the most enthusiastic overclockers. 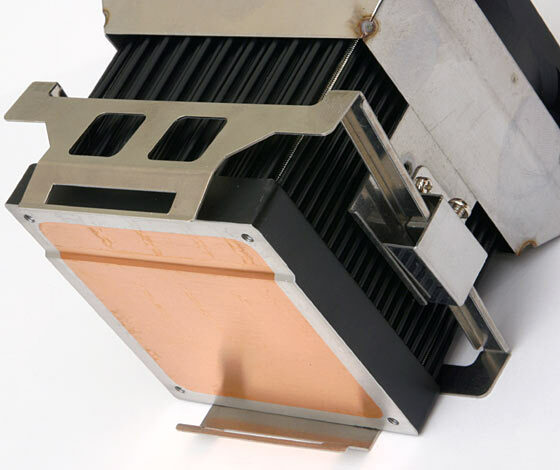 There's just not a whole lot of need for after-market coolers when you get a spiral-fin copper-cored show-off unit right there in the retail box. If you've bought yourself a slower P4 with a lot of overclocking headroom, though - like the 2.4C model I talk about here - then you probably won't have one of the nifty top-end retail heat sinks. If you want such a CPU to Be All It Can Be, then a third party cooler like the Kamakaze may be just what the doctor ordered. The Kamakaze's dual ball bearing fan has a (flashy gold-anodised) speed control knob attached to a standard rear slot cover. It's on the end of about 60cm (two feet) of wire, which means you should be able to find it a home in pretty much any case. 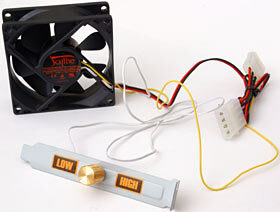 The fan also has a passthrough four-pin power adapter, and a separate one-wire cable that you can connect to a motherboard fan header if you want to monitor the fan's speed. This dual-plug connection is commonly seen on super high power fans that aren't safe to run from a motherboard header, but the Scythe fan isn't such a unit; its maximum rated run current is only 0.22 amps. 2.64 watts (0.22 amps times 12 volts) is not a high fan power. It's not vanishingly low, either, but most companies wouldn't bother putting a speed controller on a fan with this low a rating in the first place. 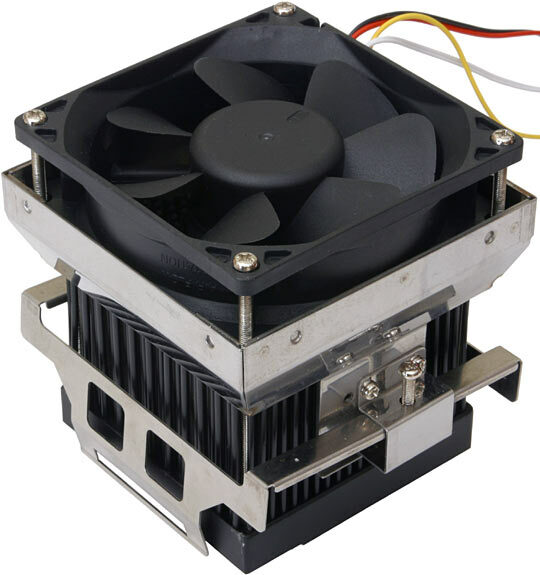 Usually, speed controlled fans are deafening howlers at top speed, and still quite audible at minimum speed, because their high powered motors tick and buzz when they're running from reduced voltage. That noise is analogous to the angry grumble that racing engines make when they're trying to idle. Scythe's idea is to give you a choice between low noise and no noise, while still delivering decent cooling performance. To see how they went at this, I attached the Kamakaze to my cooler testing rig. The Kamakaze's clip is mildly treacherous. It's well engineered - solid springy steel, engaging all three hooks on the socket, and easy to attach and to tighten, provided you've got a Phillips head driver. But it's not for the careless. This is the kind of screw-down clip where the further you turn the screws, the tighter it gets. It can get very tight. There's a more complex kind of screw-down clip that uses screws and springs. The clip is loose when the screws are tight; loosening the screws off allows the springs to take up the slack and pull the heat sink down onto the processor. The maximum tightness you can get is determined by the spring strength, and it's impossible to over-tighten such a clip. You can attach the clip all lopsided and maybe damage your CPU that way, but that takes talent. Scythe have used a more straightforward springless tighten-it-down clip design, so overenthusiastic tightening could crush your CPU or rip the hooks off your processor socket. This isn't helped by the fact that the (mildly confusing) instruction sheet tells you to tighten the screws as far as they'll go. I don't think that's likely to be a good idea. If you can control your urge to tighten the screws all the way, though, it should be easy to prevent disaster and still get the Kamakaze solidly attached. This clip is, basically, a good one; like all screw-on clips, it provides respectable clamping force without making the installation process feel like setting a rat trap. The Kamakaze I got for review came with its fan mounted in the usual, blowing-down orientation; that's how it's shown in the picture above. This is an Alpha-style heat sink and the fan funnel works as a partial air-directing shroud, though, so I tried flipping over the fan to see if it worked better that way around; shrouded sinks usually prefer an upward-sucking fan. And lo, this one did too. My Kamakaze was an pre-release unit; I presume the production coolers have their fans the right way around. Turning the fan's dead easy, anyway; the fan screws thread into the shroud/reducer assembly, not into the heat sink, so you don't have to fiddle around with very long screws. At full power, the Kamakaze fan is reasonably quiet - a low-to-medium noise unit. I think most people would be perfectly happy to leave it at full power all the time. Given that it'll be muffled inside your case, your power supply's likely to make more noise, even if it's a quiet model. The Scythe fan is also quite well balanced, and produces little vibration; vibration can contribute to PC noise as well. Anyway, cranked down pretty tightly, with the fan at full power, and tested with my Athlon contact patch simulator, the Kamakaze turned in a result of 0.50°C/W. This, to save you poring over my CPU cooler comparison, is a superb result for a cooler this quiet. Heck, it's a superb result for any air cooler. I've tested several very loud coolers that score this well, or a little better, but getting this kind of performance out of a cooler that anyone could live with is an impressive achievement. Even allowing for a more conservative clip tightness setting and less-than-optimal thermal grease application, the Kamakaze at full power should be up to the task of cooling pretty much any Socket A CPU in a case with passable ventilation, unless you're determined to hunt that very last few per cent of overclockability. At minimum power the Kamakaze becomes, for all intents and purposes, a silent cooler. I had to put my ear near it to hear the fan at all, in my office with its couple of other none-too-quiet PCs. The fan does buzz slightly, because the motor doesn't run very efficiently at low speed and fights itself a bit, but it's easily quiet enough to be useable in a lounge room PC where nothing louder than a DVD player spinning is permissible. At this power level, the cooler only managed 0.66°C/W. This still isn't a bad result at all; it's not good enough for serious overclocking, but it'd be fine for a current mid-range Athlon at stock speed, and that's more than enough CPU for a lounge room or office box. Heck, a mid-range Athlon is enough for most gamers, too. Switching everything into P4 configuration improved the scores, as it always does for dual-mode coolers, because now the CPU simulator's contact patch was much bigger. Now, the Kamakaze scored a very impressive 0.45°C/W, at full power. That puts it up there with the top-scoring P4 coolers I've tested. So unless you're doing stuff that leads you to wonder whether a foam cup full of liquid nitrogen is likely to be the P4 cooling solution for you, a Kamakaze is likely to fit the bill. At minimum power in P4 mode, the Kamakaze managed 0.61°C/W, which isn't a great result but would still be fine for a Socket 478 Celeron box as long as it had half-decent case ventilation. A medium fan power setting would give a nice compromise for a mid-range P4 system, and the Kamakaze fan would probably still not exceed anybody's acceptable threshold for living room background noise. So - where can you buy a Kamakaze? Well, if you're Japanese, you can get one from here; it's catalogue number CT_ACCCPFSC_ECR_SYT_KKF01 (ask for it by name! ), and it only costs 3762 Yen, ex shipping. That's less than $US33, as I write this, which is an excellent price for a cooler this good. Shoppers in the USA can buy a Kamakaze from Scythe's recently-created US site; they're a perfectly reasonable $US34.99, payable only via PayPal. If there are any other stores outside Japan selling Kamakazes, Scythe don't know about them. Australian shoppers can get a Kamakaze from Tier 2 Systems, for $AU75 (on special for $AU70, as I write this) plus delivery. That's a significant markup on the US and Japanese prices, but not compared with importing a Kamakaze yourself. As a Socket A cooler, the Kamakaze is superb. As a P4 cooler, it's very good, but a pain to install. It's this close to fitting in a normal P4 cooler retainer, but close only counts in horseshoes and orbital asteroid bombardment, as they say. It's not even expensive, assuming you can buy it where you live, without some importer tacking on a 150% margin. The Kamakaze's mounting system could cause a disaster if you install it according to the instructions, but just not cranking the screws down solves that problem. The Kamakaze's performance is also a lot less thrilling in silent mode, but c'mon, it's silent mode. You can't have everything. Scythe's motto is "Selected PC Parts for DIY PC Experts", and I think the Kamakaze lives up to it. It's not a CPU cooler for the beginner, but people who can use their head and a screwdriver at the same time should have no trouble with it, and reap the rewards. Review Kamakaze kindly provided by Scythe.